Insight to Action > Blog > Executive Coaching > Why Leaders Need Emotional Intelligence: What It Is and How to Get It! 1) How do I manage my own emotions so I can perform at my personal best? 2) How do I create the conditions that my employees will feel good and can do their best work? Let’s start with the first question. How do I manage my own emotions? The critical emotional intelligence skills here are self-awareness and self-regulation. Self-awareness is about knowing what you’re feeling in the moment and why, and how this effects your performance. Self -aware leaders are able to tune into the physical sensations of their feelings and see the warning signs. They have an accurate sense of who they are – their strengths and weaknesses – and are comfortable with this. They are realistically self-confident. They are able to observe themselves objectively and seek feedback from others to ensure that their self- perceptions are accurate. With self-awareness comes the possibility of self-regulation. Leaders who are self-aware and know their triggers can prepare themselves with strategies to manage them– to take a deep breath, take a time out, remind themselves of their objective in this situation. They’re conscious of their body language as well, aware that these signals can undermine their relationships even more than those expressed through words. And leaders who are strong on this skill take care of themselves. They acknowledge the heightened stress and responsibility that comes with their role and implement strategies to manage this. Assuming you have your own emotions in check, the next questions for leaders is, “How do I create the conditions so that my people will feel good, and so they can do their best work?” The critical skills to develop here are social awareness and relationship management. Socially aware leaders are able to read the emotional state of others, understand how they are feeling and why. They pick up on subtle social cues, are able to read the room and understand the political realities of the organization. They possess the all -important skill of empathy. They acknowledge all feelings without judgment and seek to understand by asking questions and listening attentively. Status – This is about where people feel they fit in the “pecking order” both socially and organizationally. People need to feel that they have a role, that they are important and what they do matters. Certainty – People want to know what’s expected of them and where they stand. They also want to feel secure. If change is inevitable, they want to know what to expect and how things will play out. Autonomy – People want to feel they have control over what they do, or at least some part of it. Relatedness – People feel safe when they form social groups and build trusting relationships. They have a huge need to feel cared for and connected to their leader and to their team. Fairness – People need to feel that they are being treated fairly – that they are fairly compensated, that they will be judged on their merits and have an equal chance for opportunities. Emotionally intelligent leaders are skilled in meeting the SCARF needs of others. This is apparent in the way they interact on a day to day basis, in their ability to listen, show interest and caring, provide praise and recognition and have respectful conversations in all situations. It’s apparent in the systems and processes they implement that address people’s needs for fairness and certainty. It’s apparent as well in the spirit of trust and collaboration they create both within their team and in their relationships at all levels. 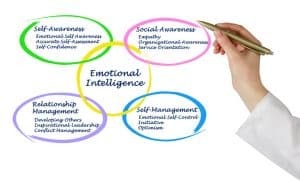 So there you have it — Emotional Intelligence 101 for leaders, or anyone who wants to create positive relationships and be at their best in all aspects. How well are you doing in managing your own emotions and setting a positive example for others? How well are you meeting the SCARF needs of your employees so that they can do their best work? Access my newsletter for more resources about emotional intelligence from leading experts in EI, positive psychology and neuroscience.